It May Be Rough, But I Can Do This. I wish I had some more positive things to write on, but I feel as though it would be less authentic. I am still in a rough patch though right now it is different than when I last wrote. At the moment, it is less about the body image, which has in fact improved to a degree since I last wrote, and more about my ongoing body’s issues/recovery post-eating disorder, my struggles with mental illness and other personal issues, the season that is very quickly coming upon us, and a general dissatisfaction with certain things in my life, which I am working so hard to change. All these things separately may not be so difficult, but together, they are overwhelming and a burden and make me feel so terribly isolated. Every if I am being tested right now in recovery and doing some extra hard work at the moment, I know that it is worthwhile. I know the alternative is not an option. No matter how hard the fight is at times, I know that I can beat whatever the obstacle may be. I have come so far already and I have the strength and ability to keep going. Sometimes it may be hard to see and feel, but I do. I must confess something… At the moment, I am really struggling. I very much hate to admit it, but I am. And I feel guilty and ashamed about it. I feel as though I should be better than this. It hurts all that much more that I am not the strong, positive person that I usually am. Right now, I am sad and upset and I am struggling to stay positive. There are several factors contributing to why I am feeling so down and a few reasons behind it. I am doing as much self-care as possible to help. It is definitely not easy to practice good self-care when you lack the energy and motivation, but that is when it is most important. It is in times like these when despite not being able to feel very much joy that still do what brings you joy regardless, still participate in life as much as possible, and take good self-care. It brings you back from the depths of whatever it is you are lost in. That is exactly the place where I am now—pulling myself back up. It is also in times like these that self-compassion is so incredibly important even if you do not believe it is. Instead of engaging in self-punishment in any form, engaging in kindness and compassion towards yourself. Tell yourself it is going to be okay, validate how you feel. Try as hard as possible to stop being upset and angry at yourself for alleged transgressions you commit. Like right now, I need to let myself know that everyone struggles and there is no reason to be ashamed or feel guilty. I am reaching out as much as I can right now as well. Having a support system is essential, especially one that is trustworthy and reliable. (Otherwise it would not be a support system!) I am very grateful and fortunate to have an amazing support system around me including my family, friends, and team members. I have been open and honest with them about what is going on and have been trying to work through what is going on. Taking breaks, naps, “time-outs”, etc. Since my last post, life has been kind of crazy for me. Between work, family, friends, and my own stuff, I had little time to catch my breath and take time for myself. I decided it was time for a self-care weekend, which is a self-care break extended. I disconnected myself from Twitter, Facebook (mostly), and home and I took the weekend to live in the present moment and take it simply for myself. My self-care weekend happened to take place just at the right time for me since my friend happened to be in town from out of state. We spent the weekend doing the Seattle tourist bit, which is always fun to do with visitors since I never really get out and do those things. 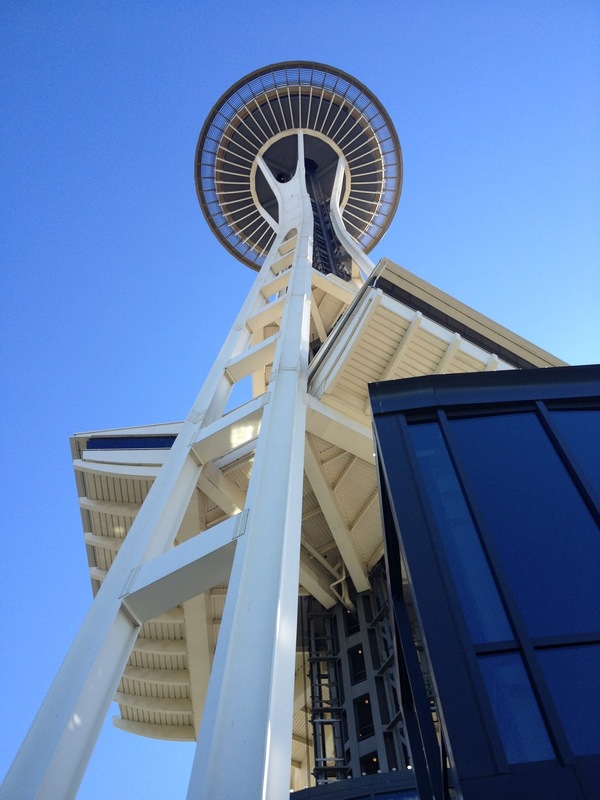 Our weekend included downtown, Seattle Center, and the piers and that was only Saturday. We also spent the weekend talking and catching up. That is invaluable when times are tougher regardless if the discussion is on the difficult stuff or not. I cannot stress the importance it had on my weekend and time spent with my friend, especially since I usually do not have that day-to-day. The possibilities for self-care weekends are truly endless since everyone is different. I would highly recommend if you are having a difficult time or are stressed out to take the time for yourself whether it is in the form of 10 minutes, an hour, a weekend, etc. Take a day or two to disconnect from social media and other types of things that are not always the healthiest. One of the other things that I have disconnected with, which I continue to disconnect from, is TV simply because I felt too triggered at the time by commercials. It is okay to take care of yourself. If you cannot believe that right now, keep repeating it until you do. Make yourself a priority and take good self-care. Check back in the next post or two for some self-care ideas. I will post some of my personal favorites. I apologize for being absent as of late. I have been so busy with work, appointments, the holiday, etc. When I have not been busy, I have been taking time to simply take a break. Much, much needed breaks. For me, breaks are essential because I get easily worn down both physically and emotionally. I need time during activities and for a day or two in between activities to just have rest. Rest for me includes a lot of alone time. I have developed this skill of self-care breaks over time. It is not always easy given that I am not always able to leave parties or find a good spot to just be alone. Also, there may not be days where I get to rest in between my schedule. Regardless of the situation, it is important to take breaks anyways. Make the time for your self-care. Ensure the breaks are well-balanced between not too little and not too much. Lastly, get the most you can from the time and space you have to work with, especially if it is not ideal. A time-out is walking away temporarily from a stressful, emotionally, and/or overwhelming event such as a party, dinner, a sporting event, or shopping. I find this is best done when I can find an alone, quiet spot. However, it is not always possible. If there is no alone, quite spot, then find the spot that is most comfortable for you. Maybe even plan it ahead of time, which I do frequently, especially to parties. In the time-out, take the time to calm yourself, collect your thoughts, and avoid impulsive decisions. This is your time to breathe and be ready to get back to whatever activity you are at. Be mindful of your thoughts and remember this is not about rumination but about calming and refocus yourself to be able to rejoin the party. Sometimes when I am worked up in a time-out, I will listen to music, Facebook, and watch cute cat videos on YouTube (because that is how I roll). If there is something you have that is calming such as reading, then be sure to have that available at events you know where you will need a time-out. Naps are so awesome for so many reasons. According to the Mayo Clinic, the benefits of napping include relaxation, the reduction of fatigue, increased alertness, and improved mood. The other benefit (though this is mostly personal) is being able to nap with my kitty. I would be this is true for any pet owner. The Mayo Clinic adds that naps are best done when short (10-30mins) or you will likely be more groggy, when taken in the afternoon to not interfere with nighttime sleep though it also depends on your personal sleep schedule, and when you have a comfortable, quiet, dark room to sleep in. If you do not follow these Mayo Clinic suggestions, do not get upset with yourself. It is okay to take the time you need, but still be mindful on your napping. It is important to keep an eye on how much rest you need, if you are getting enough, or if you are getting too much. Naps can also work as a time-out. There are times when I am so exhausted from a full day and then going to another activity where I am stressed that I need to go take a nap, for example. Sometimes these are unplanned in which I have to improved a space and other times they are planned in which I have a space picked out for naps and time-outs. If it is not too hot or cold, I would suggest the car as a great napping area. It is not always the most comfortable, but it is generally quiet. I usually have a few blankets stashed in mine, so I am extra comfortable. See what is the right option for you. A day off is exactly how it sounds–a day off. The definition of a day off will vary for everyone. My personal days off include lots of Netflix, some video games, maybe the beach (if I want to leave the house), time with my kitty, and general no-work day. I allow myself a day (or half-day if that is what I have) to rest, relax and not have to do anything. I do not schedule anything either. It is a do-whatever-I-want day. For you, a day off may include some of these things. You may decide a day off includes leaving your house, too. Whatever is most relaxing, restful, rejuvenating, and not a have-to/work-related activity is perfect for a day off. Trust me, letting yourself watch movies on Netflix for one day will not rot your brain, especially since there are now TED talks on it! Naps are great for a day off, too. (Naps are great for everything IMO!) It is about a day of rest, so rest! Allow yourself to have that time and the day to rest and relax because you need it, deserve it, and care for your mind, body, and soul. What kind of breaks do you take? What do you enjoy doing during rest and relaxation?